DHAKA • Thousands of Rohingya Muslim refugees who fled violence in Myanmar could be forced to make their new homes on a barren Bangladeshi island that floods every year. 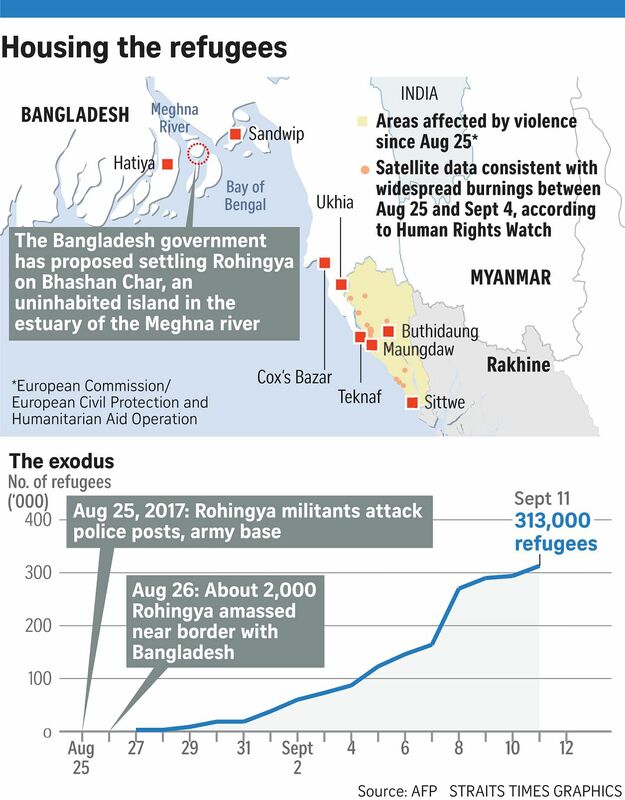 More than 300,000 Rohingya have poured into Bangladesh since the latest flare-up in violence on Aug 25, adding to around 300,000 refugees already living in overflowing camps run by the United Nations in Cox's Bazar district, close to the border with Myanmar. The surge has overwhelmed the Bangladesh authorities, who are scrambling to find land to build more camps, including on the inhospitable and uninhabited Thengar Char island - recently renamed Bhashan Char - despite reluctance on the part of Rohingya leaders and UN officials. Bhashan Char, located in the estuary of the Meghna river, is a one-hour boat ride from Sandwip, the nearest inhabited island, and two hours from Hatiya, one of Bangladesh's largest islands. The authorities first proposed settling Rohingya refugees there in 2015. But the plan was apparently shelved last year amid reports that the silt island, which emerged from the sea only in 2006, was uninhabitable due to regular tidal flooding. The government is trying to find new room for the Rohingya, including establishing a new 800ha camp near Cox's Bazar, which will house around 250,000 Rohingya. As the exodus swells, however, there are fears that the new camp may not be enough to accommodate all those in need of shelter. There is also concern that the island is susceptible to tidal flooding. Bangladesh Foreign Minister A. H. Mahmood Ali on Sunday appealed for international assistance to help transport the Rohingya to Bhashan Char. The Rohingya, a stateless Muslim minority, have faced decades of persecution in Myanmar where they are regarded as illegal immigrants. Exhausted refugees in Cox's Bazar said they did not want to move yet again. "I fled my village in Rakhine to escape murder at the hands of the Burmese," said Mr Ayubur Rahman, 26. "I don't want to go to the island. I would rather stay here." While on a visit to Cox's Bazar district to distribute aid yesterday, Bangladeshi Prime Minister Sheikh Hasina said Myanmar should set up safe zones to enable the refugees to go home. "Myanmar will have to take back all Rohingya refugees who entered Bangladesh," she said, adding that Myanmar would have to solve the problem since it "created" it. "We want peaceful relations with our neighbours, but we can't accept any injustice," she said.